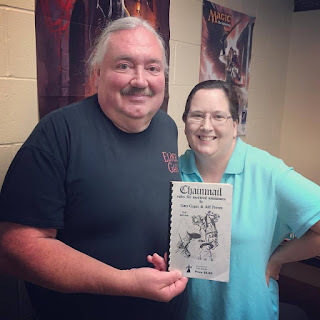 The excellent Mike Anderberg has asked Lake Geneva Games to set up some dates for 40K in the next four months including the second Sunday in September and October and the Third Sundays in November and December, from 1 PM to 5 PM. 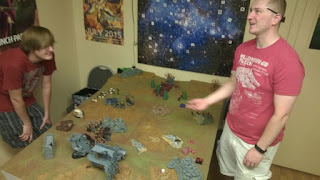 For this, the "secret" game room has been set aside allowing for three tables of 40K for two or four players per table. 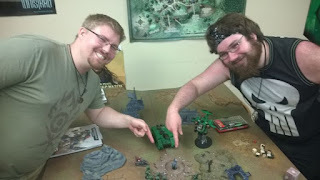 These are FREE events and Mike will host them, setting up the matches on the given day from among those who show up with armies and are ready to play. In some cases, matches might be set up in advance by Mike in the LGG40K Facebook group here. ⁃ All trips in this Detachment gain the “Objective Secure’ special rule. ⁃ An additional supplemental unit 0-1 Elite, Fast Attack, or Heavy Support. ▪ Players MUST use the same army list throughout the tournament. ▪ Codices, Codex Supplements and Warhammer 40K Campaign Supplements that are released prior to the day of the event will be allowed in this event. Apocalypse War Zone supplements, Apocalypse Formations, Forge World army lists and material from the Horus Heresy books WILL NOT be allowed in this event. 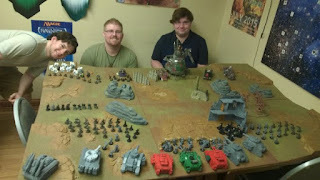 ▪ Unique units, Imperial Knights, Allied Detachments, Data Slates, Fortifications, Lords of War, Imperial Armor Units (Forge World) will NOT be in used in this event. ⁃ Vehicles with armor value facings over 12 are considered to be 12 for the duration of all games, but may be reduced further due to game effects. ⁃ Vehicles with more than 3 hulls points are reduced to 3 at the start of the game. Hull points may not be restored beyond their starting value. ⁃ All Psykers may only attempt to manifest ONE Warp Charge psychic powers.. Psykers may exchange powers as normal. ▪ All models must be WYSIWYG. ⁃ Suitable conversions and/or stand ins are allowed. ▪ Missions will comprise of objective based scenarios and will have 1 main objective and multiple secondary objectives.